Well, if you want to be really picky about it, a solar flare can't hit the Earth. It's an eruption on the surface of the sun. But a big flare can send a solar super storm hurtling towards Earth. It could blast us back into the days before electricity. 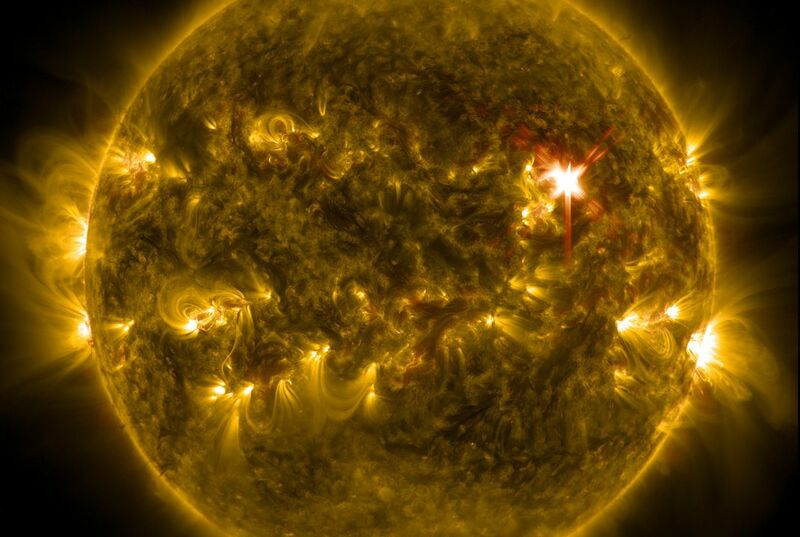 It's hard to describe how much scary stuff comes out of a solar super storm. It includes hot gasses moving at near light speeds, deadly radiation, insane magnetic fields, you name it. We had a taste of a pretty big solar storm back in 1859. It knocked out the entire telegraph system in the U.S. and literally jolted some of the operators out of their seats. Fast forward to today, where we're so completely dependent on technology that things can get really ugly. A storm as powerful as the 1859 version will probably fry a lot of satellites and our electrical grid. Millions of people could be without light, water, fuel, sewage treatment, perishable food and meds for months. And not to mention money. Your cash machine will be kaput. I think that it is good to know that a solar flare won't be hitting us anytime soon. I believe that if I were to know that a solar flare were to hit us, I would freak out. I also think that it is amazing for scientists to have known that a solar flare won't be hitting us, since the sun is far away. I really hope that solar flare never hits Earth. That would be scary and deadly. We would all probably die. I thought it was interesting to read this article because I always wanted to know if a solar flare could hit the earth. "Fast forward to today" means to skip to the present day. I think that it is cool also scary at the same time for the solar flare to easily knock us out just like the telegram system in 1859 which is pretty just creepy because some of the operators are knocked out of their chairs while using telegram. One thing about solar flare super storm might be some side effects which are hot gases, deadly radiation, even insane magnetic fields which could knock out the earth's magnetic field because of the powerful magnetic sent by the solar flare super storm.